The Phoenix Deck is not another deck in the long list of fancy decks that flooded the magic community over the past few years. Nothing against any fancy decks, they look cool and interesting and they find their card collector. I did not want to invent strange looking decks. In my opinion these decks are not usable for everyday magic as they look so unusual that they will easily arouse suspicion. At least lay audiences will always be more suspicious of unusual cards, even if they have no built-in features. That is why the Phoenix deck does not look too modern or extraordinary, as it should not look too suspicious for lay audiences. By designing a completely new but classy design instead of imitating the well-known Bicycle design like others the Phoenix Deck is drawing no suspicion at all. Trust us, red flags normally go up when a regular card player sees a “Bike Look-A-Like” deck. 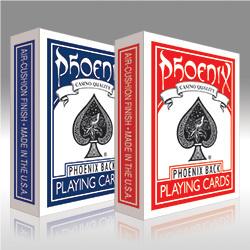 whereas the Phoenix Deck is made especially for magicians but can also be used for Poker playing. no more trick cards where the Rider back design, Joker or Ace of Spades will be changed. Even if we think that magic is the most important thing in the world, people outside of our community think quite different. This is why I started the Phoenix Deck! As a magician working for magicians and filling their playing card needs.